RECYCABLE MATERIAL WILL NOT BE PICKED UP IF PLACED IN A PLASTIC BAG. SINGLE STREAM RECYCLING COLLECTION PROGRAM ALLOWS CANS, BOTTLES, CARDBOARD AND ALL OTHER PAPER TO BE MIXED TOGETHER FOR RECYCLING. 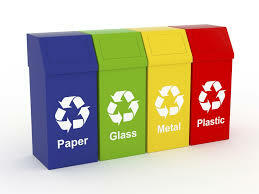 ALL OF THESE ITEMS CAN GO INTO THE SAME RECYCLING CONTAINER. PAPER - Recycle loose office paper, file folders, junk mail, envelopes, flyers, newspapers and inserts, magazines, catalogs, paperbacks, phone books, wrapping paper, paper bags, tissue boxes, cookie boxes, paper towel cores, toilet tissue rolls and frozen food boxes. NO hardcover books, stickers, label-paper, waxed-paper or Styrofoam accepted. METAL- Recycle aluminum and steel (tin) cans, loose metal jar lids, steel bottle caps, pie plates and trays. All containers must be clean of all contaminates. GLASS - Recycle glass bottles and jars with caps and lids removed. Recycle loose metal caps and lids. Bottles and jars must be empty and clean. FREON ITEMS - PICKED UP THE LAST WEDNESDAY OF THE MONTH BY APPOINTMENT ONLY with the exception of December. December pick-up will be December 18, 2019. All appointments must be made by the previous wednesday. YARD WASTE PICKED UP EVERY MONDAY BEGINNING APRIL1, 2019 THROUGH DECEMBER 9, 2019 WITH THE EXCEPTION OF: MAY 27, 2019 (Memorial Day) and SEPTEMBER 2, 2019 (Labor Day)Yard Waste MUST be recycled in biodegradable paper bags or trash receptacles no larger than 33 gallons. Plastic bags are NOT acceptable. Brush must be a maximum length of 4 feet, maximum diameter of 4 inches and tied in bundles no heavier than 25 pounds. METAL PICK UP: FEBRUARY 7th., MAY 2nd., AUGUST 1st. & NOVEMBER 7th. HEAVY BULK ITEMS such as sofas, dressers, beds, etc. will be picked up every Friday. Excessive amounts of bulk items will require the homeowner to obtain a dumpster at their own cost. ELECTRONICS will not be picked up curbside. Electronics can be brought to Borough Hall Monday-Friday 8:30AM-4:30PM and dropped off in the lobby. Items that cannot be carried into the lobby require an appointment. For additional information call973-838-7200 ext. 219 or e-mail kbecker@butlerborough.com. CONSTRUCTION MATERIAL-limit two 33 gallon containers (Fridays only). All material must be free of nails. PAINT DISPOSAL - Latex paint only (water based). Wet paint must be dried with cat litter or speedy dry. Once paint is absorbed and totally dry, it can be placed curbside any Friday with the lids removed. Oil based paints and stains must be recycled through the county. Additional information is available at: www.mcmua.com. MOTOR OIL- Must be recycled through local vendors that deal with that operation, (fee may apply) or it can be disposed of through the county hazardous waste program. Additional information is available at: www.mcmua.com. SAFE SYRINGE DISPOSAL - Syringe containers are available at Chilton Memorial Hospitals' Access Center. Syringes must be in containers. Drop off Monday through Friday 6AM-8PM, Saturday 7AM-3PM. Please call 973-831-5191 for additional information. Stormwater pollution is one of New Jersey's greatest threats to clean and plentiful water. Pollutants (gas, motor oil, antifreeze, detergents, fertilizers, pesticides, grass clippings and pet droppings) on streets, parking lots and lawns are washed into storm drains, often picking up trash and toxins along the way. The untreated water eventually empties directly into our water bodies. This polluted stormwater can kill fish and other wildlife, destroy wildlife habitat, contaminate drinking water sources and force the closing of lakes and beaches due to health threats to swimmers. Human activity is largely responsible for stormwater pollution. Everything that we put on the ground or in a storm drain can end up in our water. By sharing the responsibility and making small, easy changes in our daily lives, we can keep contaminants and common pollutants out of stormwater. It adds up to cleaner water and saves the high costs of clean-up. As part of NJ's initiative to keep our water clean and plentiful, the Borough of Butler has adopted various ordinances to meet the requirements for clean water set by both State and Federal agencies. Please go to: www.butlerborough.com and read the Stormwater Management Page for more details. Owners and tenants of all properties shall not place any containers at designated location prior to 6:00 PM in the evening prior to the scheduled collection and shall remove all empty containers after collection no later than 8:00 pm on the day of collection. Property owners must place garbage, recyclables, etc. on their own property for pick-up at curbside. No one shall place household garbage or recyclables in public receptacles. Reminder - All dogs and cats must be licensed by January 31st of the current year. Licenses will be issued in the Health Department - Monday, Wednesday and Friday from 9AM to 3PM. The cooperation of all residents is needed to make our recycling program effective. Be advised that random inspections will be made to determine compliance with our recycling ordinance. Any household found to be in violation will be subject to enforcement actions.